Here’s our Case study for a Medical Instrument Customer…..
Oil Free Screw Air Compressor. A sawing success for sheffield snooker! There was a lot of excitement around the office last week as we received a phone call from Sheffield Theatres to say that one of their Saw had gone down and they needed it fixing urgently. We’d have to work around the Snooker World Championship matches that were being held in Sheffield’s Crucible. Our engineer shot straight down to check over the Unit, tracing the wiring from the Distribution Board to the Isolator and finding a faulty 25amp Overload Relay. On his return visit with the replacement part he was on his way down to the ‘Green Room’ to grab a coffee when he stopped to where he was collared by an “Excuse me – are you allowed in here?” He turned around to find that it was the one and only STEVE DAVIS! Haha they had a good chat and he obviously explained his presence! They walked down to get coffee together where he then met Shaun Murphy as he was about to start playing. He wished him good luck and shook his hand. Star struck and coffee in hand he went back and got the Saw back up and running. Here’s Stephen Algar carrying out a 20,000 Hour Service on an Avelair 7VSD75 Air Compressor, changing the Air and Oil Filters, Separators and Oil. We also include checking over and re-tensioning the Drive Belts; checking over all electrical and pipework connections; cleaning out Cooler; generally cleaning down and inspecting machine, running-up and testing. We service all sizes of Air Compressors. Give us a call for a quote! We are pleased to offer our customer’s other services; this month we supplied and installed bespoke Extraction Plenum Chambers for Glue and Solvent work, Extracting to outside of building through Filters. After various consultations with the customer and ourselves we pinned down the exact requirements to suit the customer’s needs for their new department and the correct spec for dealing safely with flammable/toxic gases. We then put together a package that serviced their needs exactly and they now have a non-toxic environment for their staff to work in. After years of servicing a local Sheffield Steel Firm, looking after their old Broomwade V Major Air Compressors; they have decided to retire them and replace them with brand new Rotary Screws. We are supplying a Hertz Kompressoren Compressor package comprising of 2 off 55kw Rotary Screw Fixed Speed Air Compressors and 1 off 55kw Variable Speed Air Compressor complete with Controller. To follow is an introductory video to Hertz Kompressoren. The core of our business is servicing and we are pleased to say we service all types of Air Compressors from small Piston Industrial Air Compressors 1.5kw upto 7.5kw on manufacturers like ABAC, Clarkair, Fiac, Fini, Nuair, SIP Industrial, for example. For the Larger Screw Industrial Air Compressors from 4kw to 160kw on manufacturers like Atlas Copco, Avelair, Broomwade, BOGE, Compair, Demag, Fluidair International, Grassair, Hertz Kompressoren, HPC, Hydrovane, Ingersoll Rand, Smart. We can develop a servicing schedule to suit your working environment and the manufacturer’s recommended servicing schedule. Savvy Customer’s fight the rate in Crime! We replaced the old double light fittings in 2 of their workshops and fitted 32 extra lights including Trunking, Cable and associated Fittings. We also installed 6 off power points above main centre doors on both sides for their CCTV cameras, running 2.5mm, 3 core, SWA Cable back to the Fuse Boards and installed CCTV Cameras. Cleaned and replaced low bay lamps where required in all Units/Workshops. New Projects/Contracts for our Customers! Expansion is on the cards for a Joinery Customer after winning a large contract for Bespoke Doors. It’s always a pleasure to supply new equipment but even more so when it’s due to a company being able to expand. This company assisted by Finance organised for a 11kw/15HP Air Compressor giving 60cfm at 7.5bar on a 500 litre Air Receiver complete with Fridge Dryer, Pre And After Filters and a separate Oil/Water Separator. Working with their schedule of expansion we had the Compressor to them on a 2-3 week delivery, installed it on arrival and they have never looked back since. We’ve all had that nightmare moment when you’re desperate to complete a job and something fails on you. In this case, a new Customer made contact when their Air Compressor had stopped working. 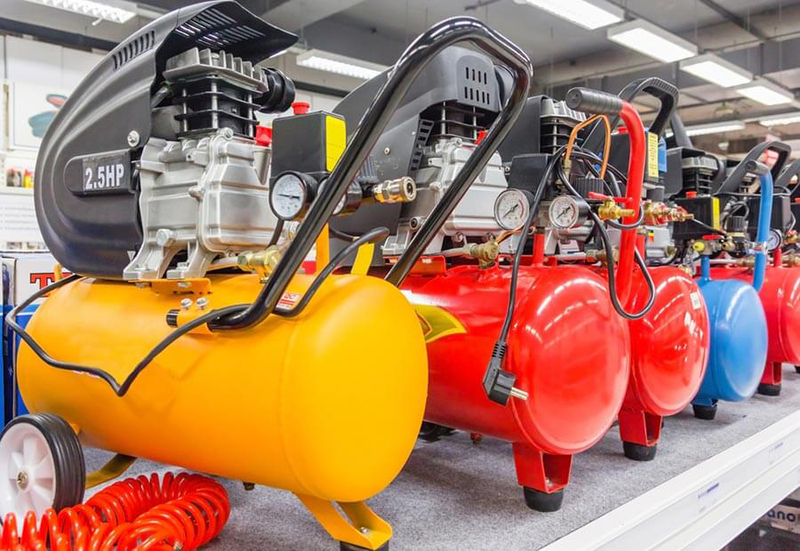 As a Garage, they needed to use their pneumatic tools and blow up tyres everyday so we soon arrived on site with our hire compressor to get them back up and running. This gave us time to weigh up the option for replacement, taking into consideration the location of the compressor (environmental conditions & proximity to staff) and application. We provided them with three options. We soon had an order and a 4kw Air Compressor was supplied and installed within a few days. We’ve now added this customer to our servicing schedule and will be back in touch with them in due course. This is part of our commitment to our customers to be your memory! You never need to remember when your compressor is due for servicing – we’ll do that for you. We welcome onboard 2 new major customers, one a Large Quarry and the other a Large Metal (Steel & Chrome) Processor. The first, providing them with a new Compressed Air System including a 30kw Variable Speed Air Compressor complete with a 5 Year Warranty (subject to terms & conditions). The Variable Speed option uses a special drive to control the speed (RPM) of the unit, which in turn saves energy compared to a fixed speed equivalent. Depending on the application the use of a VSD Air Compressor can save a factory a considerable sum in electricity costs. The second, removing some existing ½” pipework using our IPAF qualified pipework engineers and installing a new 1” pipework as required. Followed by Servicing of their Air Compressors and assisting with Insurance Inspection of said equipment. Ever wondered what is involved in an overhaul? Here is an example. The work to follow was carried out at a National Waste Recycle Plant. To carry out remedial work required on the 30kw Air Compressor. To disconnect and remove the Air Compressor from its location; including disconnecting pipework & electrics; removing the internal ducting from the Air Compressor & 2nd Atlas Copco Air Compressor and also removing end of Metal Compressor House. To install 1 off Hire-In Air Compressor. To transport Compressor back to our workshop for repairs, stripping down Compressor at our workshop, removing Airend, Motor and Cooler from Cabinet and prepare for transportation. To industrially clean Cooler. To split, clean out, rebearing and re-seal Airend. To inspect and rebearing Motor. To carry out major service changing Oil, Air Filter, Oil Filter, Separator, Suction Box and Check Valve Seals and Springs, checking all electrical connections and cleaning out Cabinet. To reassemble Air Compressor with Motor, Cooler and overhauled Airend,. To clean down and inspect machine, run-up and test. To transport Air Compressor back to site. TLC for an old V-Major! February the month of love, well, one of the 90kw Air Compressors at a Refractory Manufacturer has certainly had plenty of TLC. Our engineers carried out remedial work to the Air Compressor as it was reported to not be working correctly, checking over Compressor, we found the HP side had flamed out, stripping Unit for further inspection, finding Non Return Valve not working, Valves broken, Piston Rods, Piston Rings and Packings worn, all reported back to our customer for approval of remedial work to start. Then the engineers returned to install re-chromed Piston Rods. To cut Piston Rings to size and install Pistons with correct clearance settings. To install Oil Scrapers, Packings, Piston Plate Cover Kits, Big-End Nuts, Bolts and Washers, all associated Gaskets and Seals and grinding out ridges in Cylinders. To install LP Head, finding HP Head blocked, attempting to clean on-site, unable to clean. To transport HP Head back to our Chemical Cleaning Specialists to chemically clean, polish out air ways and water ways. To collect HP Head, transport back to site, install HP Head and full set of Valves complete with Coppers and Rubbers. To remove NRV Unit, cleaning out and installing new Valve, cleaning out sight glasses, running-up and testing. New Year – New Compressor! This month we have supplied a Printing Firm with a brand new 30kw Air Compressor ready for them to tackle the new challenges that this year will throw at them. Due to the Major relocation of a Percussive Down Hole Rock Drilling equipment Manufacturer, our engineers have had 2½ months of on-site co-ordination; seeing the completion of a Large Scale Compressed Air Pipework System with over 299 metres of 2” & 1” Galvanised pipe and working with all on-site Contractors to maintain efficiency and customer output during a difficult manufacturing period. We have supplied hire equipment when required and connected up machinery as and when it had been transported to the new works. Compressed Air Engineering isn’t all we supply to our customers –for instance, we have had manufactured, per our specification, Lamination Booths for the process of Chemical Carbon Fibre Products complete with Filtrations, for use at an Orthotics Specialist. Good news – Companies still expanding despite recession. We were pleased to see that our long standing customer, who produces Posters to be supplied all over the world, has bought new premises to accommodate their ever expanding business. We have put together a new Compressed Air System comprising of 15kw Air Compressor, suitable Refrigerant Dryer complete with Pre & After Filters to cool the air and remove moisture/contamination and an Oil/water Destroyer to deal with the condensate. All the Compressed Air Equipment is now installed by our first class engineers. Good job boys! One of our new Packaging Customers this month has taken a full Compressed Air System package from us; we have supplied and installed an 18.5kw Screw Air Compressor producing 110cfm complete with 500 Litre Air Receiver/Tank to store the Compressed Air, Refrigerant Dryer @ 120cfm to remove the moisture including Pre and After Filtration and an Oil/Water Destroyer to deal with the condensate from all of the drains. Good luck to them on their expansion! This month we have completed a major re-location of Compressed Air Equipment for a Customer of ours who pride themselves on producing precision machined components. Predominantly supplying to the petrochemical power generation, aerospace and construction industries. As experienced Compressed Air Engineers we were able to manage every step of the relocation work required; supplying the 10ft Steel Container (the new Compressor House); installing 1” pipework from the Ringmain to the new location within the 10ft Steel Container ready for the Avelair Air Compressor and installing Ducting for the ventilation of the exhausted warm air coming from the Air Compressor with weather Louvre to allow Cool air to the Air Compressor.